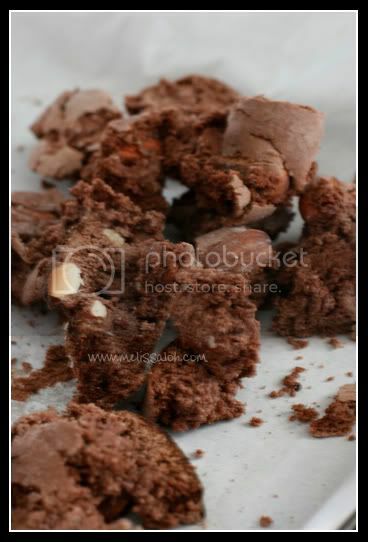 A biscotti is an Italian cookie, which is twice-baked and generally long and dry. They come in as many flavours as regular cookies and fairly commonplace at most coffee shops and cafes. 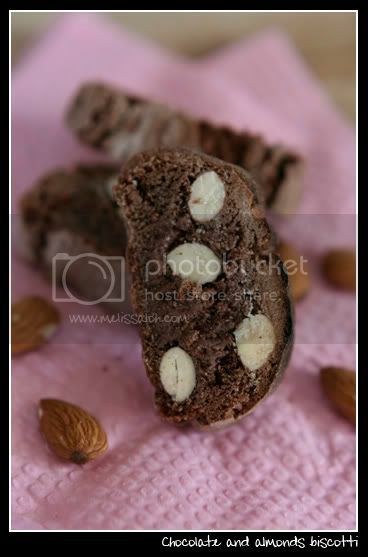 Traditionally biscotti were almond flavored and only use eggs to bind the ingredients together. Recipes with butter or oil are softer, but will not keep as long. While I generally don't have biscotti with my coffees (an increasingly distressing habit), my hands and kitchen are victim to butter fumes from a full day of shortbread baking. Waking up to butter scented hands is enough to make me hurl right now. And what better to match the hot humid weather we've been having here in Queensland than a traditional dry hard cookie? Mix the egg, egg yolk, sugar and cocoa powder in a large mixing bowl until smooth and thick. Sift in the flour and baking powder, and toss in the almonds, mixing well. Once the dough has formed, turn out on a lightly floured surface to knead lightly until smooth. I prefer to make mini thicker biscotti, so roll out the dough into 20cm logs of 8cm width. Pop them on the prepared baking tray and flatten slightly. Bake for 30mins or until golden brown. Take them out and turn down the temp to 140ºC / 120ºC fanforced. Allow the logs to cool on a rack for 15 mins. This cooling is very important. Otherwise when you take your serrated knife to them, they will be too soft and crumble like the Berlin Wall. Once cooled, cut the log diagonally into 1cm thick slices. Discard (or eat) the ends. Place the slices back on the baking tray in a single layer and bake for 20-25 mins, turning them over mid-way through the baking. Cool for 5 mins. Serve with coffee or mug of hot cocoa. Yummy. Your biscotti looks so nice. Last time I made biscotti, I cut it a little too thick, and all I got were complaints that it should be thinner. "Just eat it and enjoy!". I think I was most surprised though, at how quick it was to put together. *LOL* I cut mine quite thick as well, but only cuz I made thinner logs. And it's true! I might make more biscotti if it's that easy to whip together. Doesn't take many ingredients either. are you going to teach me how to make yummy stuff like this!!! If this is the kind of thing you wanna learn to make, sure! But I must warn you I'm not that good a baker. Pretty pastries is not my forte. You can substitute the flavours with just about anything you have around: orange rind, lemon rind, cranberries, coffee granules, cinnamon, honey, white chocolate, pistachios, macadamias, walnuts, etc. The possibilities are endless. This page was loaded Apr 26th 2019, 12:39 pm GMT.